We’re deep into the beginning of the Information Age, as you can see from the propagation of information aggregators like Google Reader and the meta-aggregators like Friend Feed. There’s only one tip for handling information saturation that has any success: delete it. CoinStar — Is It Worth It To Convert Your Spare Change? When I was a kid rolling up the spare change to take in the bank, I always wondered why there wasn’t a machine that would do it for you in bulk. Sorting coins mechanically isn’t rocket science; all you need is holes of different sizes. Now we’re in the 21st centuary. We might not have jetpacks but I see these CoinStar sorting machines in every supermarket I go to. According to their website they are free if you use them to buy prepaid gift certificates for sites like Amazon.com (US only) or there is a small service fee of 8.9% US or 9.8% CDN to get cash. They say it can count coins at a rate of 600 coins per minute. It’ll definitely save you time (provided you’re going to the grocery store already). But is it still worth it with that service fee that us Canucks are stuck with? It’s pretty easy to figure out on the back of an envelope. I’ve said before that one of the best ways to gauge productivity is to know the net value of your time. So using CoinStar with larger coins (quarters, loonies, twoonies — yeah, we have weird money up here) isn’t worth it at all. Even the nickels and dimes aren’t that good a deal. But the pennies? For sure. It’s a different story if you can use CoinStar to get gift certificates without the hefty service fee, but that isn’t an option in the Great White North. The good news: your bank might already have a coin counter that is free for use of its members. Give them a call to find out. This week I’ve been talking about code profiling and how if you want to analyze the performance of your application you need to work with large sets of data. Application efficiency isn’t free, it requires measurement, analysis and change. Unsurprisingly, performance analysis for a software application and performance analysis for aspects of your life have a lot in common. When people ask me how to make their computers faster, my answer is always “more RAM”. The biggest reason why software applications run slowly is because they don’t have enough memory to operate efficiently. People work the same way. You can improve your memory by getting enough sleep at night and by mind-dumping. Mind-dumping means write things down instead of trying to keep it in your head. Human memory works like computer RAM where it needs constant refreshes of remembering something to keep it from becoming forgotten. By writing down lists of what you have to do in the future you free up your mind and your attention to focus on the present. 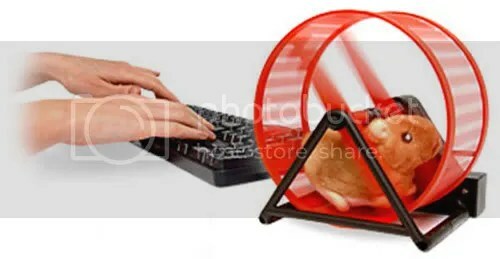 Another reason why computer programs run slowly is because there are too many other things going on at the same time. When I’m trying to figure out why a Windows is so slow the first thing I do is look at the task manager or system tray to see what is running at the same time. Context switching between multiple programs adds additional overhead of saving and restoring state information, and if too many things are happening at the same time then nothing gets done. Like how a computer program will run faster if it’s the only program running, you’ll be able to complete tasks faster if you are focused on only one at a time. Maintaining a list of what you want to accomplish means that when you’re done one task you’ll easily be able to check your list to find something else to work on. Having a list of everything you want to do also makes it easier to prioritize and focus on what’s most important to you. It’s easy to read advice on what to improve, but unless you look at your own life and where your time goes you don’t have a clear idea of how your time is wasted. There are several ways to track how your time is used. David Seah’s Printable CEO has print templates that let you easily measure where you are spending your time. I like to use GTDWannabe’s version. 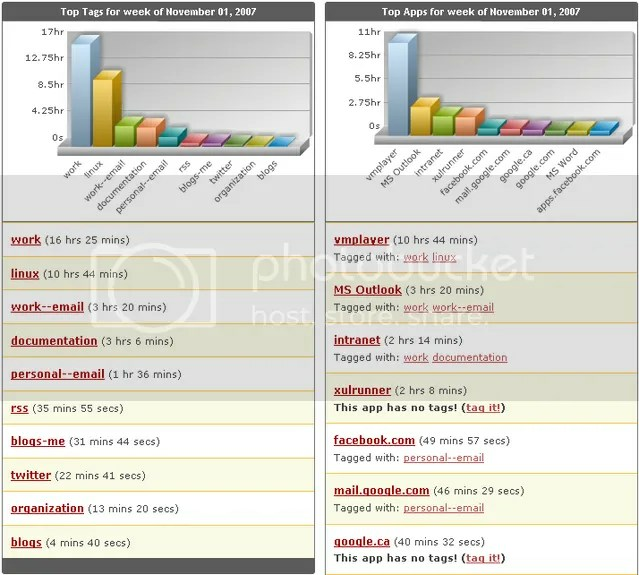 There are a few tools out there that will automatically monitor your computer usage and generate reports about how you spend your time on the computer: TimeSnapper and RescueTime. I’ve been a RescueTime beta tester for a month now and I have to say that I really like the service. You can see from my chart that I wasted about 2.5 hrs on personal tasks at work that week. There may be a correlation between working too much overtime and goofing off. Because I know where I’ve spent my time, I know what I can stop doing to free up more time. “If you want something done, give it to a busy person.” Nothing makes you more aware of how you are spending your time like when you have no free time at all. Testing your application in a worst case scenario where it has to deal with large sets of data will help you find performance problems. It works the same way with other aspects of your life. Coming back from a vacation where you haven’t checked mail, email or RSS feeds for two weeks will help you identify the chaff. It’s a great opportunity to unsubscribe from newsletters and set up filters for the major time offenders. 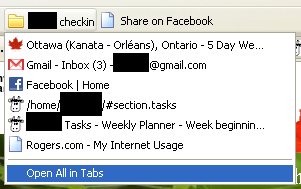 You can turn off email notifications when you get messages from Facebook. That relative who always emails you jokes can get their own special folder that you’ll never check. When you have to deal with handling a lot of data it forces you to get rid of the unimportant information. As you measure how your software application performs, you’ll find features that seemed like a good idea but drastically consume resources. Quite often it is easier to cut those features out rather than spend time improving them. As you measure where you spend time in your life, you’ll find that at their are time consuming activities that seemed like a good idea at the time, but don’t contribute to any of your goals. Don’t spend time on activities with no benefit. Efficiency for efficiencies’ sake is one of the worst trends of the 20th century. But efficiency in the tasks you have to do frees up time for the tasks you want to do. Every thing you spend time on has an opportunity cost for other things you could be doing with that time. Having idle time in your life frees up room for the unplanned and unexpected. The fine folks at LifeHacker have forced me to tip my hand with their post on using Web Runner as a distraction free browser. Web Runner is a tiny site-specific web application that runs using less resources than Firefox or Internet Explorer. The whole idea behind a site specific web browser is that you want to access a web application without being tempted to access other sites. You want to access a site without being distracted by the rest of the Internet. 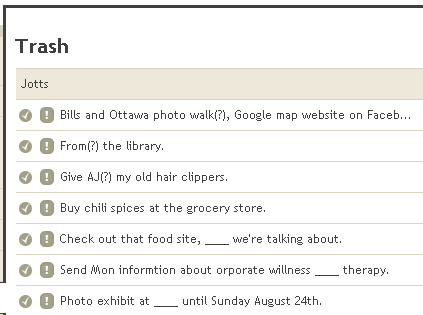 A good example is an online todo list or GTD application. You want to be able to quickly access your todo list to add or checkoff items without getting caught in an Internet black-hole. To make things easier for everyone I’ve created a huge bundle of Web Runner web applications centered around accessing ToDo/GTD web sites. 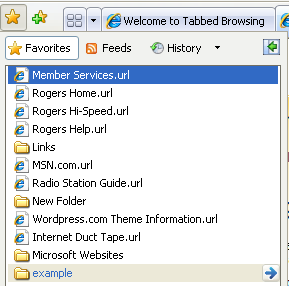 This is a list of the supported sites. Want more sites added? Leave a comment. Every web app has hotkey history navigation (ALT+LEFT, ALT+RIGHT and ALT+HOME). Leave a comment if you have any problems. 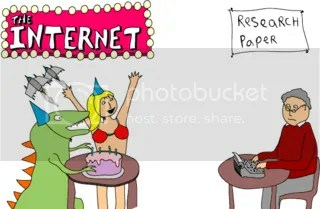 The biggest problem with the Internet is that it’s entirely too easy to get distracted. We’ve all wilfed at one time or another — what started as an innocent task-related web search ended up down some rat hole of links until you’re reading a web comic about falling into a couch and confronting the dark nebulous force of Lost Things. Stupid internet, so bright and shiny and full of useful and entertaining information. 43Folders recommends setting a procrastination dash to attack tasks you’re having trouble getting started on. The (10+2)*5 system suggests doing 5 intervals of 10 minutes of work, followed by 2 minutes of “me time” as a way to get yourself on a groove and find your flow. It’s a great system, and it really works, especially if you use the Instant Boss software. Instant Boss is a tiny software app that will let you know when your 10 minute / 2 minute timers are up. If you want to take a longer break than 2 minutes (because you’re saving an interesting article, or writing an email to a friend) then it will keep reminding you to get back to work every minute on the dot. It’s one of those great little applications that works exactly as specified. I highly recommend it. 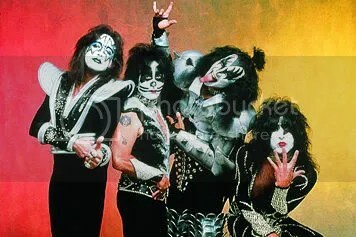 One of the best known programming axioms is KISS — Keep It Simple, Stupid [wiki]. It is something I have incredible difficulty with. “I spent the next couple hours running an impromptu focus group, watching the kids and their bombshell nannies play with it. By the time that Marta touched my hand with her long cool fingers and told me it was time for her to get the kids home for their nap, I had twenty-five toy ideas, about eight different ways to use the stuff for clothing fasteners, and a couple of miscellaneous utility uses, like a portable crib. “Weren’t you worried he’d rip off your ideas and not pay you anything for them?” Szandor’s spellbound by the story, unconsciously unrolling and re-rolling an Ace bandage. Adding features means more coding. Tweaking existing code that already works fine means more coding. If I let something be finished then that means I’ll have to stop coding. But even he notes that the answer to simplicity isn’t having less features. Having a sparse highly usable design is a feature in itself. The key is to have robust features without confronting the user with multiple choices. Simplicity is actually quite complex — which makes sense because otherwise Apple and 37signals would be the rules, not the exceptions. Reduce – The simplest way to achieve simplicity is through thoughtful reduction. Organize – Organization makes a system of many appear fewer. Time – Savings in time feel like simplicity. Learn – Knowledge makes everything simpler. Differences – Simplicity and complexity need each other. Context – What lies in the periphery of simplicity is definitely not peripheral. Emotion – More emotions are better than less. Trust – In simplicity we trust. Failure – Some things can never be made simple. The One – Simplicity is about subtracting the obvious, and adding the meaningful. Part of the reason why I blog is because it forces me to work on soft skills like this. It’s a subject I need to learn more about. 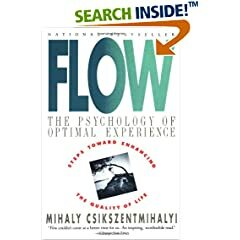 Matt from 37Signals has a definitive post on “Flow: The Psychology of Optimal Experience” by Mihaly Csikszentmihalyi. The comments are as good as the post. I went so far as getting “Flow” from the library a few months ago when Kathy Sierra recommended it, but I couldn’t get past the first chapter. It reminded me too much of the Celestine Prophecy, and that’s never a good thing. But writing style aside, it’s the information that matters. Flow is that state all programmers love where we’re head deep in the code and things are progressing beautifully. It’s when we’re at our most productive, and the best way to increase your work performance is to learn how to enter and remain in flow as much as possible. It’s also one of the reasons why interrupts are so disruptive; once you’ve lost that state you cannot easily regain it. I am my own worst enemy when it comes to achieving my deadline goals. These are tips / reminders I’ve found useful through work experience. Most of the tips are general, but some are specifically suited to programmers/engineers in situations with long compile/simulation phases (compiling is the act of building an executable, simulation is the act of running it to completion). Do I follow these? Of course not. But I should. Keep a spreadsheet with Feature / Task / Priority / Original Estimate / Current Estimate columns. Track effort in hours, not days/weeks. Tracking in hours forces you to do a straw man analysis of the tasks that are needed upfront. Tracking in longer intervals of time encourage more “rough guessing”. Use Excel. Mind you, Joel was the project manager for Excel once upon a time. See original article for the other guidelines. After the break, evaluating different programs.